It is always good to have fun at work by getting together for a birthday celebration (where my co-workers excel at bringing in massive amounts of food for everyone! ), a bowling happy hour or a baby shower for expectant mothers. I helped out in the planning on one such baby shower recently by organizing the "card" for us all to give. I use the term card loosely because we ended up putting together a book. 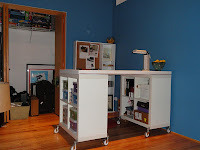 This idea could be a fun one to use when you are organizing a "gift from all of us." Full disclosure, I actually used this idea for another co-worker's baby shower, but we've had enough new people start in the last four years I don't think anyone noticed I recycled the project idea! The book was called, "What's in Store for Baby Huffman?" I started by soliciting my co-workers for a photo of them as a baby or small child "doing something" so that I could compare the action to something that the new baby might enjoy herself one day, like eating ice cream, being out on the boat or helping out in the kitchen. Coming up with a caption would have been much harder if I just had a portrait headshot to work with! The book is from Michaels - I purchase these same photo albums to make my recipe books. Or, my one recipe book. The second one is sadly still in its early stages and not fit to share at this point! Using a 10"x10" scrapbook paper set I already owned, I created a page for each baby photo. I also asked co-workers to provide me with a message to the mama when they submitted their photo. This was not only to have different colored paper peppered throughout, but also to reduce the stress of getting everyone to sign a card an hour before the baby shower! I'm only sharing my page because I don't believe that my co-workers would appreciate their baby pictures strewn across the internet! A few of the others read, "Will she be future chef like Kristen was?" "Will she be a snazzy dresser like Becky was?" and "Will she be a little princess like Courtney was?" We even had a fake baby or two in the mix - "Will her first words be 'Accio Baby Blanket!' like Harry Potter's were?" I should clarify that this baby is only fake in the sense that it is not one of my co-workers. 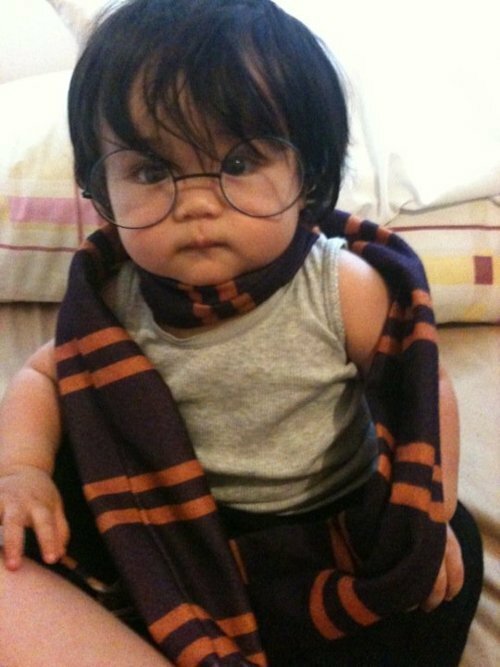 This baby is likely quite real somewhere in the world and I apologize for using your image without consent, but you are just too darn cute Harry Potter Baby! Whatever she does, whoever she becomes, we know she'll be better off because she has you as her mom. I left the original white pages from the album in between my pages so that the mother-to-be can reuse the book as a photo album in the future. Or, maybe she'll want to keep our photos in it forever and ever and her daughter will eventually ask, "who are all these people????" The book was cute, but the cake was cuter - this isn't the actual cake, rather just the reference photo. My co-worker is neither Daisy nor Eduardo. Though we joked that we should have just included the names shown here when ordering. Please picture it in pink! Thinking about a cake maker leaving on the sample names prompted me to check out cakewrecks.com. It had been awhile. Coincidentally, the homepage that day featured baby shower cakes. 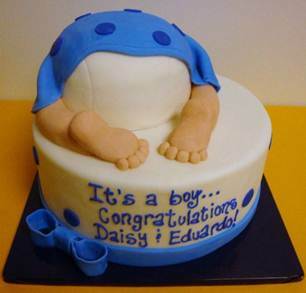 Have you ever seen anything creepier than a cake shaped like a belly with a protruding footprint? How about one with five seperate feet?? Holy Moses.